WL Central will be updating news on the United States, with new items added at the top. You can contact me on twitter @GeorgieBC or by email at admin@wlcentral.org. @USDayofRage (currently 1,216 followers) has announced a facebook page, a facebook group, and a facebook profile along with the previous twitter account and hashtag #USDOR. 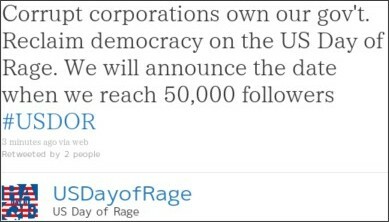 On March 10, we established the Twitter profile @USDayofRage and the hash tag #USDOR as a common rallying point for Americans (and supporters worldwide). Four days later we have 1077 followers and are growing at a rate of about three followers every ten minutes. Americans are outraged because they realize that there is something terribly wrong with the way our nation is governed, and the way in which our public discourse is conducted. The nation’s institutions, meant to underpin the principles of our democratic republic, do not function effectively in the 21st century. Their failure leaves us prey to rampant corruption, unprincipled and abusive government action, and a demoralized populace. We @USDayofRage place democratic principles before any particular personality or party, even our own. Talking point politics and double speak only compound our nation’s problem. They corrode our primary column, the intelligence and genuine good will of the American people. We are currently organizing a national non-violent protest to reclaim democracy on an official US Day of Rage. We will announce the date when our Twitter profile reaches 50,000 followers. We have established an official hash tag on Twitter, #USDOR, where we call on Americans and our supporters worldwide to voice their grievances. Our official Web site, coming soon, will become a public platform that enables effective public discourse by curating the main hash tag into secondary hash tags along major themes. We invite subject matter experts and civic leaders to help us design our public platform, which will host and moderate real public debate, and provide a means for citizens to interact and create real solutions to our nation’s problems. We are deeply humbled and called to a great purpose by the events of this week. Following in the footsteps of revolutions taking place across North Africa, the Middle East, and Near East; it appears that a ‘Day of Rage’ is coming to the United States. Or so it seems, according to a new profile created on Twitter, @USDayofRage. In what appears to be the beginning effort of a group of activists, two profiles: an active one on Twitter, @USDayofRage, and one parked and inactive on Facebook, Usday of rage [sic], appear to be in the process of being readied. As of today, the twitter profile has 104 followers. The active profile on Twitter has a call to action for citizens to lists their grievances by using the twitter hash-tag #USDOR.